We have recently had a query about a strange substance which looks like vomit, curdled custard or even a strange flower along leaves and stalks of grass all over the Moor. It is in fact a fungus called Dog’s Vomit Slime Mould which is quite prevalent on the Moor this autumn. It is completely harmless. Details of the AGM 2011 Minutes are now available. Our Newsletter 2011 Sept 11 – No 27 is now available. This spring the cows were brought on to the moor earlier than usual and in greater numbers. This was in order to keep the grass short so that the Council could tackle the thistles. However, the dry spring and early summer has meant that the grass hasn’t grown as much as normal and it is now too short for the cows to eat. They have therefore been moved by the grazier and will not return until next year. 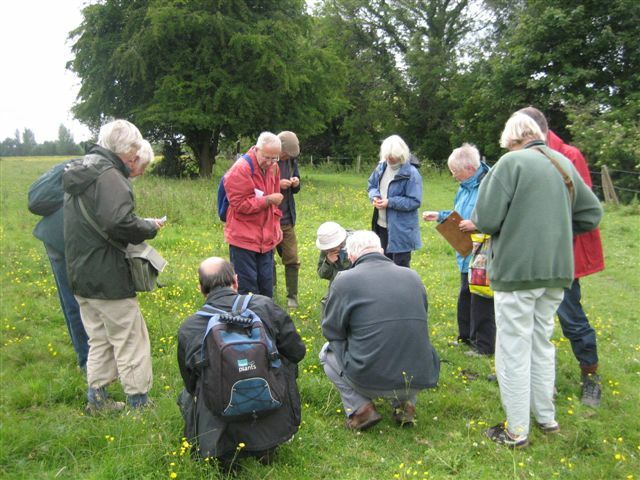 On Sunday 19th, Mark Tyszka gave another of his fascinating guided walks around Hob Moor. Here he is showing us the variety of grasses and wildflowers that are so easy not to notice under our feet as we walk by. One evening in early June, founder member of Friends of Hob Moor Elizabeth Smith gave another of her excellent talks about the history of Hob Moor. 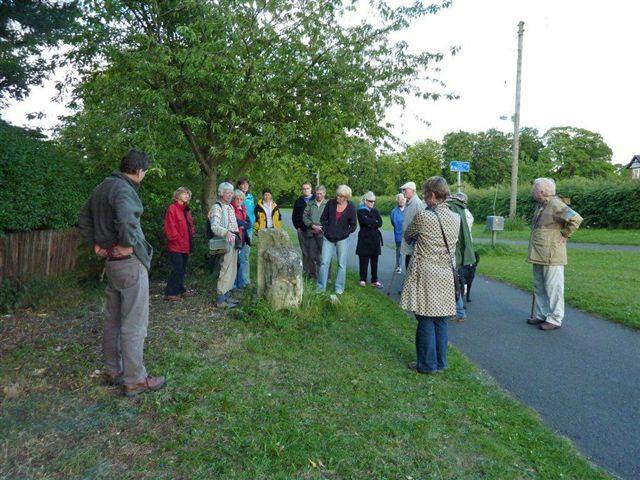 In this photo Elizabeth is explaining the origins of the Hob Stone on Little Hob Moor. In spite of the windy conditions and a few spots of rain in the morning, the annual Hob Moor Fair was a great success with well over 500 people attending. There was a large range of stalls ranging from wildlife and conservation to story telling, face painting and henna tattoos. 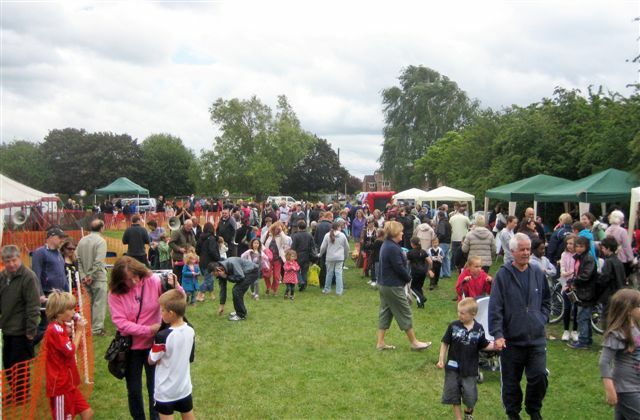 Entertainments included a falconry display, music, a fun dog show and a bouncy castle for younger children. The Friends of Hob Moor stand was well attended and we signed up a number of new members. 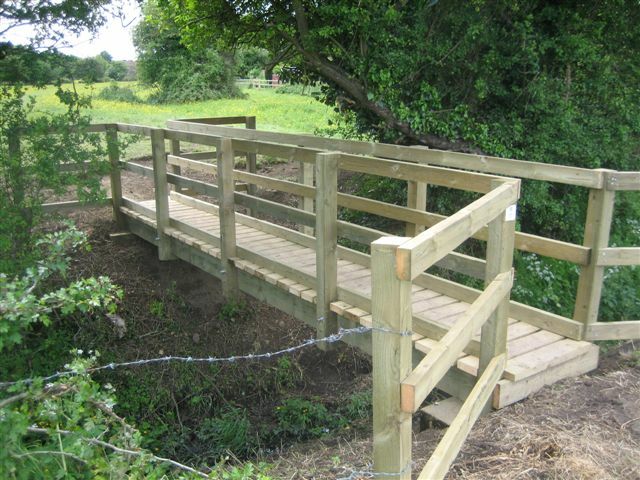 A new footbridge has been installed between North Lane field and the main part of the moor. This is part of the Stewardship scheme which will enable the closure of North Lane field to the cattle over the summer months. It was installed by the volunteer group BTCV and looks excellent. Some gates will be added at each end to stop the cattle using it. The path leading from Tadcaster Road to Hob Moor via Little Hob Moor has a long history. The first reference we have to it is in 1602 as ‘Hob Laine’, when it ran along the old city boundary. 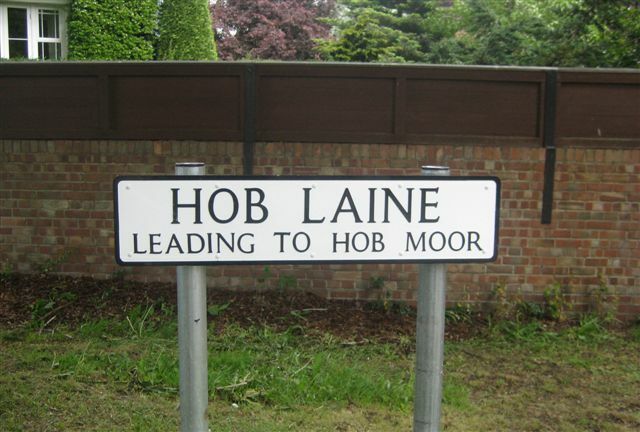 Later maps have it as ‘Hob Lane’. Over the years, the name was lost, as the path was no longer a designated city highway. With the council’s permission, Friends of Hob Moor recently funded a road sign for the path, reinstating its original name. So here it is, just by Tadcaster Road. On the 14th, 19 intrepid members joined the Council’s Countryside Officer Bob Missin at 4.00am on a walk round the moor to listen the dawn chorus. The birds were in full voice and the sunrise was beautiful. To hear a recording of the birds, click the arrow below. The first swifts were seen flying over the moor on the 6th. As part of the Stewardship scheme, a water pipe has been sunk beneath the moor’s surface behind the Lidl supermarket. At present, there is nothing at the end of the pipe but a cattle trough will be connected shortly. This will facilitate the closure of North Lane field to the cattle in the late spring (where the other trough is). Further details about the Stewardship scheme can be found here. Our exciting new Events programme for the year can now be found here. Our Newsletter 2011 April – No 26 is now available. Bird news: a heron was spotted in the garden of one of the houses on the northern boundary of the moor. A sparrowhawk regularly hunts around that area as well. A new section about the surveys carried out on Hob Moor has been added here. It details the latest ecological survey carried out last year and the plans to address the issues it raised. 48 Aberdeen Angus cows arrived on March 9th, with another smaller group to arrive shortly. The cows are here earlier than usual this year as part of the Stewardship programme to tackle the ever-spreading thistles. The cows will keep the grass short which will enable the treatment of the thistles with herbicides later in the spring. A new section has been added about the Environmental Stewardship scheme here. A number of siskins (below left) and redpolls (below right) were spotted in a garden that overlooks the north side of Hob Moor at the start of the month. Changes in North Lane Field. Together with the Knavesmire, Hob Moor has been entered into the Defra Higher Level Stewardship Scheme. This scheme provides money to landowners such as York Council to manage their land in a way that enhances or maintains existing landscape features, habitats and historical features. This is an exciting new development for Hob Moor and should lead to improvements in its management over the coming years eg in areas like thistle control. Further details about the Stewardship scheme will be added to a new section on the website this spring once the full plans have been agreed. As part of the initial changes to be implemented by March, North Lane Field will be managed as a hay meadow. This means the cows will be excluded from the field until a hay crop has been removed in August each year. To achieve this, the existing gate into North Lane Field will be kept closed and two new footbridges will be installed across the ditch between the Moor and North Lane Field to allow public access but keep the cows out. A new water trough for the cattle will also be installed on the main part of the Moor near to the Lidl supermarket.